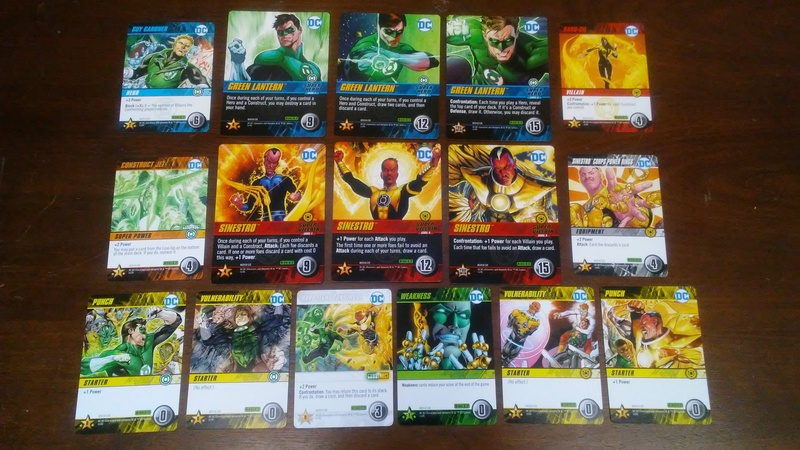 DC Deck Building Game: Rivals – Green Lantern vs. Sinestro is a standalone game as well as an expansion for the DC Deck Building Game. It’s works especially well with the Confrontations and Rivals: Batman vs. The Joker sets, which make it possible to play with more players. It is designed by Matt Hyra and Nathaniel Yamaguchi, published by Cryptozoic Entertainment. By itself, the game is for 2 players. In this game, players will take on the role of either the Green Lantern, Hal Jordan or Sinestro. They will need to gain more powerful cards as they battle it out, defeating even stronger versions of their opponents character. In the end, the player that is finally able to knock out their opponent will be declared the winner. Setting up and playing this game is a little bit different than that of any of the regular box sets for the DC Deck Building Game. However players familiar with the Rivals- Batman vs The Joker game should find a lot of similarities here. Armed with that information, let’s take a look at how this game is laid out and played. To begin, one player chooses either Green Lantern or Sinestro, while the other player takes the remaining character. Each player will take the 3 oversized character cards for their chosen character, placing them face up in a stack in front of themself with the 9 on top, the 12 in the middle and the 15 on the bottom. Each player takes a starting deck of 7 punch cards and 3 vulnerabilities with symbols that match their character. The Hard-Light Construct cards and the Weakness cards should be set aside into 2 separate stacks. The remaining cards are shuffled together to form the main deck. Once shuffled, the deck is placed face down in the middle of the play area. The top 5 cards are drawn and placed in a row beside the deck. This is called the Lineup. The Hard-Light Construct and Weakness stacks are placed near the end of the Lineup. Each player shuffles their deck and draws their top 5 cards. The first player is chosen and play now begins. The game is played with over a series of turns with players going back and forth, taking turns until one player is defeated or the Lineup is unable to be refilled. On a player’s turn, they must first decide if they want to take a normal turn or confront their opponent. A normal turn consists of the player playing cards from their hand to buy cards from the Lineup or Hard-Light Construct stack to power up their deck. Most cards create power which makes it possible for the player to buy or defeat cards in the Lineup. Once bought, or defeated in the case of heroes or villains, these cards are placed in the player’s discard pile. Once a player runs out of cards in their deck, their discard pile is shuffled together to create a new deck. Some cards will provide special abilities, on top of power which can help the player be able to do more and purchase even more powerful cards. Vulnerabilities and Weakness cards provide no power and only weaken the player’s deck. Each player’s character card will also provide the player with special abilities that may be used during their turn. The other option that a player has is to confront their opponent. If a player chooses to do this, they may not buy any cards from the Lineup or stacks this turn. Instead, they will play cards from their hand to gain the power needed to try and defeat their opponent’s top character card. It should be noted that each character has 3 versions that are progressively stronger and harder to beat. If a player is able to generate enough power to meet or exceed that character’s cost, then it is removed from the character stack and placed near the attacking player. Once an attacking player has played all of their cards, the defending player may play any number of cards with the “Block” keyword to increase their character’s cost. Each of these Block cards contain the word in bold text with a number in parentheses. This number is how much that the character cost is increased by. Block cards are discarded after being used. As long as the attacking character’s power is as much or more than the defending player’s cost, the confrontation is successful and the player loses their top character card. Once a player has played all of their cards or chosen to end their turn, the remaining cards in their hand and any cards played are placed in the player’s discard pile, except for cards with the “Ongoing” keyword. These remain in play near the player. Any “end of turn” effects are resolved. The player then draws the next 5 cards from their deck. If there are any empty spaces in the Lineup, the top card from the main deck is drawn and placed into the empty space. Play then passes to the next player. The game continues until one of two conditions have been met. If one player defeats the other player’s last character card through confrontation, then the game ends and that player is the winner. The other way to end the game is if the Lineup is unable to be refilled back to 5 cards, then the game ends immediately and scoring occurs. Players add up their victory points from the cards in their hand and their deck, subtracting victory points due to Weakness cards. Players also gain victory points for any defeated character cards. The player with the most points is the winner. This game comes with some of the greatest looking cards. To start with, there are 60 main deck cards that have a mixture of heroes, villains, equipment, super powers and locations for both Green Lantern and Sinestro. These cards are deep into the Lantern universe of DC comics. Each one has amazing artwork that looks ripped right out of the comic books. All of your favorite characters make an appearance from Kilowog and Guy Gardener to Parallax. Needless to say, there’s some really cool designs. There are also 3 oversized cards for each character, Green Lantern and Sinestro. These are the same size and quality as those in all of the other DC deck building games and are very similar to those in the Batman vs Joker Rivals expansion and the Confrontations set. The new Hard-Light Construct cards take the place of the Kick cards in previous versions and core sets. There are also new punch and vulnerability cards that are character specific. That means that for Green Lantern, his punch cards show him punching the bad guys while Sinestro’s have him attacking the heroes. The weakness cards all have the same design, but what a design that is, showing GL with a stash of rings on each hand. The game also comes with a thick plastic divider card that makes it possible to add the contents of this game to the Multiverse box, keeping everything organized. I just love that. There’s also a randomizer card that can also be used with the Multiverse game’s rules and cards. I have to say, I really like how extremely cool each card looks in this set. Overall I think fans of the DC Universe and especially Green Lantern and all his cohorts and villains, will really love everything that’s included in this one. I’m thoroughly pleased. The rulebook for this game is about the same size as those in the Crisis expansion packs, except that this one has a few more pages. There are plenty of pictures throughout the book, although there aren’t any examples anywhere to be found. Of course if you’ve played any of these games, you’re pretty well covered and don’t really need that. The rules are covered rather well. Everything that you need to know is pretty much covered. The book does include some additional rules on the order of playing your cards, attacks and defenses and resolving card abilities, just to name a few. Once again, these are pretty much common knowledge for anyone familiar with any of the previous content for the DC Deck Building Game. The book also includes clarification on several of the cards along with pictures of each one in question. The final parts of the rulebook include instructions on how to combine this game with the DC Deck Building Game: Confrontations core box, as well as the DC Deck Building Game: Rivals – Batman vs. The Joker set. Finally the back page of the book includes all the basic info such as turn sequence, info on normal and confrontation turns and the end of turn steps. This is a nice added reference that’s rather helpful for first time players. One last thing about this book that must be mentioned, every time that you flip the page, the background color of the page is a different color. It goes from green to yellow throughout the book which is a really cool little thing that doesn’t really add anything as far as the game goes, but looks cool anyway. Overall, I think the book does a good job without requiring too much time spent reading rules. I’m pleased with the look and feel of it all. In case you’ve been living under a rock or simply weren’t aware, I’m a big fan of the DC Deck Building Game. I’m also a huge comic book fan. It’s no wonder then why I would automatically be drawn to this game. I’ll be honest, the Green Lantern Corps have always been a little more interesting to me then plain old Hal Jordan the Green Lantern. Not that his character is bad in any way, just that I think the aliens appealed a little more so to me than he did. I will say this though, I like Hal a lot more so than Kyle Rayner. Never really cared for him. But enough about the characters, what about the game? I love it. Did you really think I would say something different? I really enjoyed the first Rivals game with Batman and Joker. At the time, it was a completely new way to play the game with just 2 players. Next came the Confrontations box set which took that 2 player game to 4 players but with a lot of the same mechanics and rules. I remember when the Confrontations box came out, I was thinking…where’s Green Lantern? I thought for sure that he was more popular than Zatanna. That just didn’t seem to make sense to me at the time. Of course I should have realized Cryptozoic had a plan, namely this game in the works. Needless to say, it was worth the wait. I really like how easy this plays and how it sticks to those ideas already presented in the earlier products. If you think you have power in your hand to take down your opponent’s character, you declare a confrontation. You throw everything you have at them and hope they don’t have any blocking cards to strengthen their defense too much so that you can defeat them. Of course the name of the game is building up your deck, after all it’s a deck building game for a reason. The one thing I’d like to point out that is a bit different with this game are the construct cards. The Hard-Light Construct cards take the place of the Kick cards in the original games and count as a construct card. There are some cards in the main deck that have card effects that will reference these constructs; cards like the villain card, Karu-Sil. This particular card states that the player will gain +2 Power when the card is played, but when it’s used in a confrontation it gives +1 Power for each construct that the player controls. It’s a pretty neat way to approach the things that Green Lantern and Sinestro can make using their power rings. Needless to say, I really think fans of the DC Deck Building Game and especially Green Lantern and/or the Green Lantern Corps, will really enjoy this game. If they already have the first Rivals game or the Confrontation box set, they’ll enjoy it even more as it adds quite a bit to those games. This is a game or expansion, whichever you want to call it, that I would highly recommend. It’s a must have in my book. 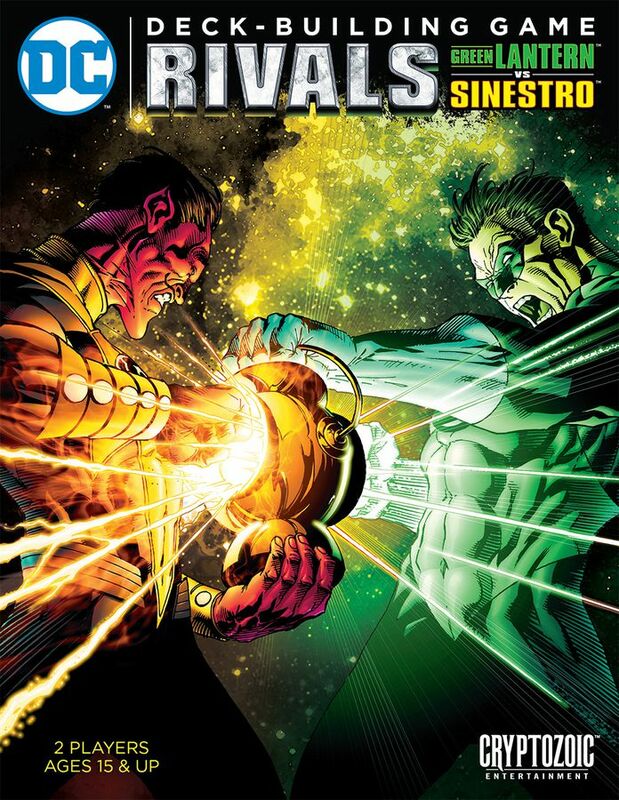 DC Deck Building Game: Rivals – Green Lantern vs. Sinestro is an expansion/standalone game for the DC Deck Building Game. It works especially well with the Confrontations and Rivals: Batman vs. The Joker sets. In a lot of ways, the gameplay is similar to that in the previously mentioned versions of the game. It doesn’t take very long to play. Most game sessions last around 30 to 45 minutes. The cards are absolutely awesome! The artwork on each looks ripped straight from the pages of a DC comic book. There are new card types that replace some of the older ones, as well as new artwork for the regular cards like the punch and vulnerabilities. All of the cards and designs are pulled straight from the Green Lantern universe, so you should be able to find your favorite Green Lantern Corps member or villain. The game play is very similar to that in the Rivals: Batman vs. the Joker game, and has some similarities to the Confrontations set. It can easily be mixed in with either of these with very little trouble. I love playing this by itself as well as mixed in with the others. It’s a lot of fun. Fans of the DC Deck Building Game should really enjoy this one, especially if they’re fans of the Green Lantern or Sinestro. This is one that I highly recommend. For me, it’s an absolute must have. Let those who worship evil’s might, beware my power….ah, you know the rest. This entry was posted in Reviews and tagged board, board games, building, card, card games, dc, dc deck building game, deck, games, green, green lantern, hyra, lantern, matt, matt hyra, nathaniel, nathaniel yamaguchi, rivals, sinestro, yamaguchi. Bookmark the permalink. Awesome review! Just discovered this game existed today. Can’t wait to get it.